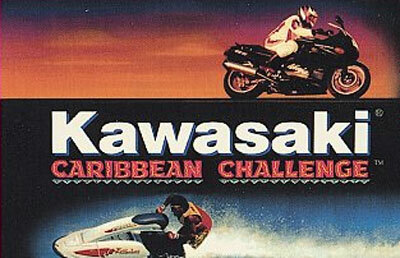 If you enjoy the spray of the ocean or the smell of island winds, KAWASAKI CARIBBEAN CHALLENGE has something for you. Choose a power Jet Ski and hit the water as you race against competitors on some of the bluest seas in the world. If you prefer to stay on land, hop onto a Ninja motorcycle, and race through the heart of the islands. Either way, you have complete freedom of movement in each race. Digitized pictures of the Caribbean as well as digitized engine noise will make you think you're really there. On land or sea, KAWASAKI CARIBBEAN CHALLENGE has something for everyone.